Sabaton was formed back in 1999 in Falun, Sweden and worked hard with demos and small club shows just like any other band. An album was recorded in 2002 bearing the name of Fist for Fight on an independent label in Italy, but was never released. By 2004, the band was becoming increasingly frustrated with the lack of marketing opportunities available for their album, so eventually they decided that their best strategy would be start over with new material . A new demo was recorded bearing the title ofPanzer Battalion. At this point Sabaton had become much better songwriters and the quality of the songs was a lot higher than before which of course gave result. Several labels immediately contacted Sabaton but after stranded negotiations Sabaton decided to record an album without any help from any label. Primo Victoria was recorded and was fully paid by the band members themselves. With this masterpiece in their hands the band now returned to some labels and the bidding started. Winner was the Swedish label Black Lodge who gave a fair offer and a deal was made. About one year later, in 2005, Primo Victoria was one of the most successful debuts ever to come from a metal band on an independent record label. The band played bigger and bigger clubs and was soon one of the most popular bands in Sweden. Meanwhile Sabaton also was launched into the European market which led to immediate success. At this time it was no longer possible to have a “normal” life so jobs, apartments and girlfriends had to go away. This was a hard sacrifice but the band decided that the band goes first. About one year later Sabaton entered the studio once more with the mission to follow up the great success of Primo Victoria. The result of this session was to become one of the best selling metal albums in Sweden in 2006 and win several awards worldwide. Before the release and to promote the two albums Sabaton went on a 6 week European tour with Edguy and DragonForce. That tour became a great success and was followed up by the release of Attero Dominatus. The band was now recognized all over the continent and was now able to successfully tour as headliner in Europe for the first time. In 2006 the band did more shows than most bands and was able to handle three European tours plus being the opener for Lordi in Sweden. The first activity in 2007 was a five week long European tour with Therion and Grave Digger. This was a very successful tour for Sabaton and journalists all around Europe praised Sabaton over their tour mates. Once Attero Dominatus had been released, and after almost 2 years of negotiation with an earlier record label, the original debut album of Sabaton saw the light of day when it finally became available as a double-CD compilation called Metalizer. Even though it was just intended for the fans and gained no real hype or marketing campaign it still reached #1 position on Swedish hard rock selling charts and topped the leading record stores sales for months. 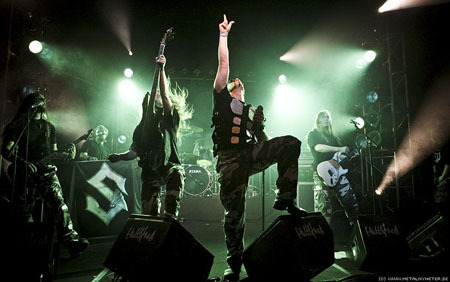 The album was also followed up by the first bigger headline tour of Sabaton which reached several European countries from east to west and lasted for about five weeks. During 2007 the band was one of the hardest touring metal bands and did over 80 shows in more then 20 European countries and played at several of the biggest festivals in Europe. This bodes well for the future and new albums! In January 2008 it was time again for a new recording and with material good enough to top the previous albums, the band returned once more to abyss studios where they worked with both Tommy and Peter Tägtgren to reach a new level with the new album. The new album was to be based upon an ancient book called “The Art of War” which was written 600 years B.C. by a Chinese general, so a great amount of research was made. With a heavier sound, much more powerful songs and fantastic new artwork, the album The Art of War was ready to invade record stores worldwide in March. But as the band refused to take a rest, they instead packed their bags and travelled to America for their first US show in Austin, Texas during the huge South By Southwest week. The band returned triumphant to Sweden with new deals and contacts and America now stands ready to fall. Awaiting the release of The Art of War, the band, which still consisting of the original members, has already booked up every weekend for 6 months with over 60 shows, including the main stages of several of Europe’s biggest festivals and one big headline tour plus one of the most massive tour a metalband have done in Sweden since years.